How to tweak the colors? 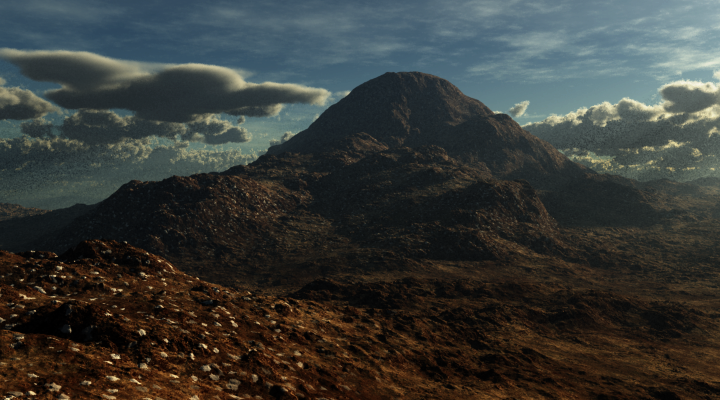 Hi, this tutorial is fine to overcome the fear to terragen 2, thank you very much. In my first try, I got some rather wrong, unrealistic colors, mainly for the dirt (small image). I just tweaked a bit the colors (dirt and grass) and I think the result is better (second image). What do you think? Any hint about how to pick the right colors for a terrain? Try reducing the coverage, and increasing the breakup of your grass to expose more of the underlying soil. Choronr and Inkydigit gave good advice for grass colours earlier in this thread. Try using the eyedropper tool in an image editing app on some landscape photos to pick out the colours of soil. Of course the actual colours will depend a lot on the lighting. But, generally soil will be not-too-saturated browns. Your image seems very misty. Check your haze settings, both for strength and height. Also check that your Lighting Strength setting isn't too high. Or you may need to reduce the Gamma correction on the Effects tab (to 2 or below) in your Render parameters. Along the coastal regions of the the Carolinas, the soil has a very red tinge to it. I try to make soil look like it may have come from the hills around it. (The rocks and bedrock) I have also had luck using a brighter green with a power fractal color input of a drab green works for grasses. The trick is to use the first two color sliders to get the mix to look right. This tutorial was very helpful, I appreciate it! I went for a desert look. This took about 5 1/2 hrs to render, time to get a new mac! This looks very good. I wish my first renders looked as good. I think you may be hooked on Terragen 2 now. Welcome! Well done, Warner. Glad you found the tut helpful. What were your render details (quality, AA, GI relative detail, GI sample quality. And was GI surface details checked or unchecked)? Did you use the latest release (2.1) for the render? It is faster than previous releases. Increasing the Atmosphere samples to say 40 or above should get rid of the noise in your atmosphere. Thanks! glad you like Marc and njeneb. I'm hooked to the many possibilities TG2 has for film scenes. I'll be getting my feet wet with animating cameras soon. Speaking of which, does anyone know if there is a depth of field plugin for the Mac version of Terragen? John: Thanks again. Well, I actually just downloaded 2.1 (today) so yes, future renders should be faster. edit: GI surface details were unchecked I think. The image came out slightly hazier then I wanted as you can see attached below, so I went into photoshop.I will try that with the atmosphere samples. Welcome! Nice start. Make sure to read the Sticky on Render Settings, in the General section. Wow; downloaded 500 times. Never expected it would be this popular. That, for me, is thanks enough. But your kind words are much appreciated, Bobby. Thanks, I'll take a gander at it before I do another render. Hello, just wanted to thank you for the tutorial. It is excellent, simple enough to complete quickly and understand but in depth enough to give a general idea of how to create a great scene.